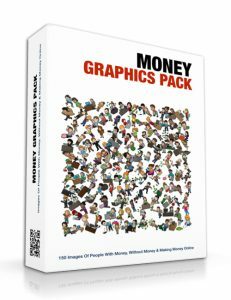 If you're involved in online marketing/consulting or if you're in the make money online niche then these 150 amazing animated images will be fantastic for your business or blog. Creating long-form content is one thing but when you combine images in the text, that engages your readers to a whole other level. People are enamored with great images and it's proven statistically that content with images gets more likes and shares. That's why if you're not making use of visuals in your blog or site or presentations, you need to grab this pack now. There are so many amazing graphics here that you won't know what to do with it all. If you're blogging about money making methods and giving advice on all the different ways that people can make new streams of income, you'll be able to emphasis your message even better with this collection of graphics. It's better that you start adding graphics to your content as it will extend your SEO to greater lengths through optimized images which Google loves. Whenever you're ready, hit the download button. It's far too good for you to pass up. 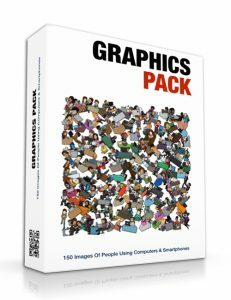 This monstrous pack contains 150 animated images of people using computers and smartphones. And do you know what appeals to people most when they're visiting a website or social media site? Graphics and colourful visuals. You can use these images for any purpose, be it for your blog, presentations, marketing campaigns, social media pages and whatever else. It helps considerably when you mix visual elements with text content because of how the human eye digests information. When a book is divided by chapters, it's far easier for the reader to consume and understand the content. And this is how Google prefers blog content to be written. Sub-headlines, short sentences, paragraphs, etc is the way to go for top rankings. And just as importantly, Google insists on a healthy use of images to keep the content interesting and attractive to the reader. Not to mention that images can be optimized for search engines as well which increases your chances for gaining a lot more traffic. This is a heck of a great collection developed by amazing artists and it's yours with the click of a button. Grab it now. In the world of real estate, realtors have used the usual marketing efforts and same old boring business cards, flyers and signs to get their message out. Other than showing lovely pictures of the listing itself, realtors haven't really had a way of bringing flair and spark to their marketing efforts. Until now. 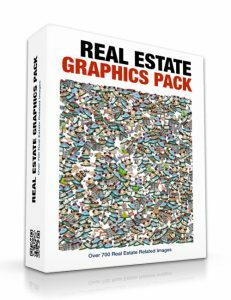 Inside this incredible pack consists of over 700 animated images in a variety of formats which you can use for your own real estate related business or project. Graphics and images are a fantastic way to get looks and sales. People simply take notice of visuals and the key to make your listings and presentations work is to make them different from everyone else. On top of these numerous graphics are 10 videos, slides and infographics covering topics like how to raise your credit score, choosing a realtor, home selling mistakes, selling and buying your home and more. This pack is simply phenomenal and if you want to really put some wallop in your work then grab this pack now. It's no surprise that people digest information better and faster when they see it visually as opposed to seeing it in long drawn out text. 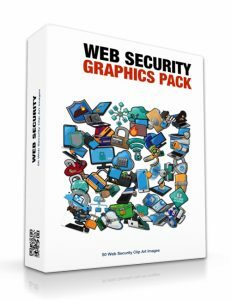 With this Web Security pack of high quality graphics, you can add more legitimacy and appeal to your blog, site, marketing campaigns and content. The internet security niche is massive as people want to both learn how to protect themselves and stay protected. If you're in the web security niche then even better because these graphical elements will be fantastic for you. There are 50 graphics in this pack in both PNG and Vector formats. One important thing to note is that having disclaimers on your site about your site being a safe place and compliant to laws and regulations gives comfort to your site visitors. If you're running an ecommerce business then even better because customers want to know that there's no risky business during payment transactions. It's always good business to have your audience know that they are in a safe place when doing business with you. And they'll understand it better when it's right in their face visually. When you're ready, hit the download button. 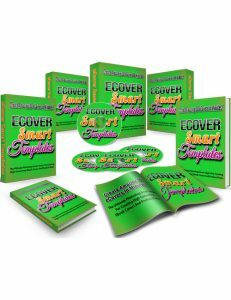 Ecover Smart Templates is one of the most amazing tools you'll find anywhere. You can create professional level product covers though Photoshop within a matter of minutes along with unlimited product shots. As much as some people will disagree, marketers know that visuals and high quality graphics count for a LOT when it comes to the marketing world. People are enamored with great imagery and on top of that, images are liked, shared and go viral throughout social media platforms like Pinterest and Instagram. This tool gives you 54 cover templates and action scripts which you can use for any purpose. So now it's time for you to say goodbye to your graphics person and do the work yourself without breaking a sweat. The way it works is you simply take your flat cover artwork, run it through the tool, and voila...you got yourself a photo-realistic 3D image. And from there, you're ready to take it to your website, blog, sales page, or any marketing campaign. Inside this package you will receive product-templates like books, book bundles, CDs, mobile devices, DVDs, iPads, magazines, notebooks, smartphones, software and much more. Ecover Smart Templates is simple and easy to use with very little design skills needed. When you're ready, hit the download button. If you're heavily vested in video marketing or are looking to add videos to your marketing campaigns, then you don't want to skip over this amazing collection of animations. 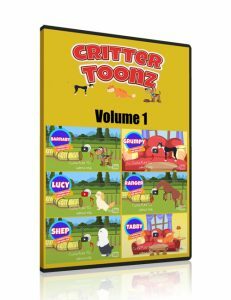 Crittertoonz is an amazing pack consisting of several animal characters in over a hundred different animations. If you're running a business involving animals such as your own pet grooming, veterinary, dog walking, or pet sitting business or running an ecommerce business selling animal related products, then these animal video animations will be an amazing addition to your business in a variety of ways. You can use them for your social media campaigns, marketing videos and presentations on YouTube, or use them on your blog or website. People love videos and it's proven as people are digesting video content more than any other type of content not to mention that video content is shared across the world within seconds. These animations come in SWF, MOV and GIF and can be used anyway you wish. If you're ready for something amazing to take your marketing campaigns to the next level then grab Crittertoonz now. If you want to really add some spark to your videos then New Year Mascot Maker II is the way to go. If you're in the business of selling and marketing or are trying to get your business off the ground, you need to be attentive to the power of video marketing. It's been proven that over 50% of people are consuming video content through mobile as we speak and much of that involves the purchasing of products. With this pack of animations, you can develop your own whiteboard videos or video presentations while overlapping the videos with your sales pitch. You can also use these graphics for your website or blog or sales-pages. Visuals are very powerful and they command attention. You can also use these mascots to develop or revamp your brand or logo. Don't feel threatened if you're not a graphics wiz because these graphics can be manipulated through various software including PowerPoint, Photoshop and Gimp. Instructions are enclosed to make it a breeze and you'll be surprised at how easy it is. When you're ready, grab this pack. You'll love it. Guaranteed. In the modern age of online marketing, video has taken precedence and more and more marketers are utilizing video marketing to gain an audience. Many big-time YouTubers have managed to build successful careers through the video streaming platform but in the marketing world where the purpose is to build your brand and make sales, it's not always feasible for many marketers. Reason being that lacking personality or being shy in front of a camera doesn't help you build an engaging audience. But thanks to the power of animation and cartoon characters, you can develop presentations which are just as effective if not more effective than becoming a video personality yourself. Whether you want animations for your site, your social media or marketing campaigns or for your video content, this pack is ideal. You get the female version of the popular Mascot Maker graphics series. You can use them for your logo, brand or anything you wish. It's been proven that people are more engaged with video content than text content. And people love animated characters. This pack is a winner so grab it now and watch your videos thrive.